The Church had a rather stormy history, changing its owner and destination several times. It was initially an Augustinian monastery, with "Saint Michael" as titular saint and a Dominican Church in the second phase (1553-1556). Between 1579 and 1588 the Church belonged to the Jesuit order, at a time when they had been expelled from the citadel. Somewhat odd, Cristofor Bathory, the voivode of Transylvania was buried here in 1581. The Church remains deserted until the beginning of the 18th century, when the Jesuits return. In 1778, the Jesuits abandon the Church for good and the building was transferred to the theological institute. In 1783 the building changes its destination and in 1896, a higher secondary school was built on the former grounds of the church and a part of the monastery domain, later becoming the Mailath Roman- Catholic high school. 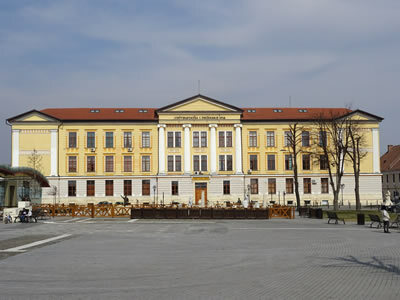 Until a Romanian high school was built in Alba Iulia on February 1, 1919, many Romanians studied here, sometimes being more numerous than Hungarians. A high school for girls also functioned here, then high school no. 4. The building is owned by the "1 Decembrie 1918" University at the present.